Here are some facts about Blaise Pascal. 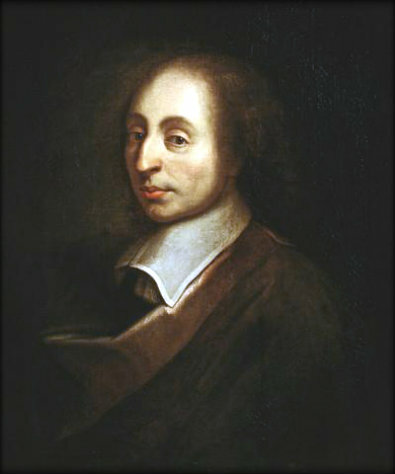 Blaise Pascal was a French physicist, inventor, mathematician and philosopher. He also studied the properties of fluids, and researched and wrote about probability theory and projective geometry. He was born in Clermont-Ferrand, France in 1623, and was interested in mathematics and science from an early age. By age 16 he was presenting mathematical theories that he had devised. In 1642, Pascal invented a calculator with movable dials, to help his father calculate taxes. He devised and built 20 calculating machines, making him one of the first people to construct a mechanical calculator. Pascal was fascinated by the concept of the vacuum, and he conducted important research. During one of his experiments he carried a barometer to the top of a 50 metre high Paris church tower. The hydraulic press and the syringe were both invented by Blaise Pascal. He also devised an early version of a roulette game, and experimented with measuring pressure with a barometer. Blaise Pascal developed a mathematical theory of probability, based on his interest in gambling. He also carried out important work into the relationship between gasses and liquids. Pascal became interested in religion and philosophy and wrote important works on the subjects. His famous work, the Provincial Letters, was written to defend another theologian of the time. After having a religious vision in 1654, Blaise Pascal became less interested in science and mathematics. He wrote several important books on Christianity and philosophy, such as his book, the Thoughts. One of his last achievements was the development of an early bus route to transport many people at once. He died in Paris in 1662, rejecting the help of his doctor. Blaise Pascal has lent his name to a programming language, a unit of pressure and a hydrostatics law. Pascal’s Triangle, a diagram of prime numbers, is also named for him.